There's no reason to rely on dodgy moodlets to be informed about your sim's temperature. 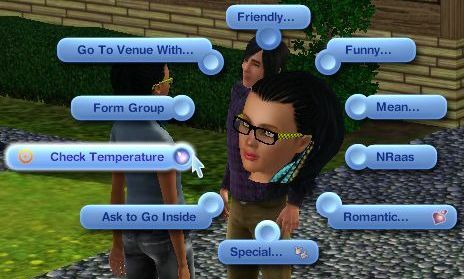 With this mod installed, you will be able to click on any sim and instantly get a report detailing the temperature of all sims in the target sim's household. This is a pure script mod and has little to no chances of ever conflicting with any other mod ever. To check a sim's/household's temperature, click on the Sim and choose "Check Temperature"
Babies and Toddlers will show their temperature as N/A, as they do not have a temperature motive. You can't use the Check Temperature interaction on a baby/toddler, if you are not friends with someone in their household. Check Temperature interaction cannot be used on a Service Sim NPC. Temperature will be listed as N/A when traveling in WA worlds, as sims do not have a temperature motive in WA worlds.